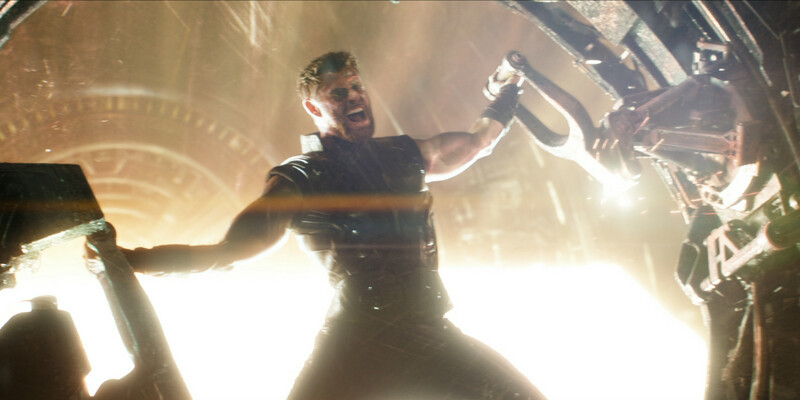 Thor's New Weapon Forged in Infinity War Trailer? Thor has said goodbye to Mjolnir after Ragnarok, but The Avengers 3: Infinity War trailer shows him hard at work making a new weapon. Fans will need to use their imagination, and look past Chris Hemsworth's MCU-ruling biceps to see it. But for those who know Thor's comic book history and the true origins of Mjolnir, the hints are all here. Will it be too soon for some fans of the MCU? Certainly. After all, Mjolnir had been inseparable from the god of thunder through each phase of Marvel's movie universe so far. But then, Mjolnir's death made Ragnarok possible - opening the door for Thor to become the hero the universe truly needs him to be. But all the lightning in the world isn't going to win the fight against Thanos. For that, Thor needs a weapon fit for a god back in his hand. To follow the clues dropped in Infinity War's trailer, fans will first need to know a bit of the mythology behind the actual construction of Mjolnir... even if it isn't a new Mjolnir Thor is forging this time around. The movies offer little beyond saying that the hammer was "forged in the heart of a dying star," but it's hard to actually grasp what that's meant to communicate. The forge was located inside a star? Did the hammer being made kill the star? Why is the star important in the process? And most importantly, where did the actual magic of Mjolnir originate - and after Ragnarok's revelations, did it ever have any power at all? We can't say for sure what the MCU might clarify, but the comic book origins of Mjolnir are a bit clearer. Originally, Mjolnir was a gift from the Dwarves of Nidavellir, their own realm which existed on the same land mass as Asgard (again, let's hope that wasn't the case in Ragnarok). Specifically, it was a weapon forged by their three best smiths with help from the sun. In the classic version, the sun's rays penetrated their shop and were captured, with Mjolnir forged from "molten sunshine." In the more modern telling (above) such a weapon needed a sun's heart to even forge the mold. Different stories, none accounting for the "magic" gifted to it via Odin's own mystical power, but agreeing one one fact: it takes the energy and heat of a sun to craft a hammer like Mjolnir. And even for dwarves, it's only been done once or twice in history. The Trailer Shows Thor Using a Solar Forge? Keeping those details in mind while watching the trailer for Infinity War, the shots of Thor take on significant meaning. It's obviously a far cry from anything even remotely resembling a traditional 'forge' - and in the comics, the Dwarves were depicted as medieval or Norse, not futuristic or cosmic in origin - but there are similarities. The modern origin (above) also included rings of metal on either side, visible in spirit in the screenshot above (albeit with some Marvel spectacle and budget behind it). But it's the sunlight streaming in through the crack behind Thor that may confirm our suspicion. The rumors of Peter Dinklage playing a secret role in Infinity War stirred up plenty of speculation, with many citing the actor as the perfect person to bring the kind of gravitas and authority needed for Eitri - the greatest smith of the Dwarves. Photos of his new hairstyle for The Avengers saw it dyed deep red (the go-to color for dwarves these days), and Thor's trip to his solar forge would make Eitri's appearance necessary. On top of it all, the fact that Thor is the one apparently doing the heavy lifting may also explain the rarity of Mjolnir. If the heat and pressure of harnessing a sun's power can make even the god of thunder scream, then it's possible nobody since Odin has tried. A New Axe, or A New Mjolnir? Amidst all this speculation, there's one piece of official evidence to fuel the fires of a new heavenly weapon: the Infinity War concept art showing Thor grasping... something. It's certainly built with a longer hilt than Mjolnir, but that only narrows it down to two likely candidates. Chris Hemsworth personally teased that Thor's new weapon is from the comics, so fans of the hero who are up to speed on both the Ultimates version of Thor and Thor: God of Thunder will know the frontrunners already. With Jason Aaron's God of Thunder series diving into Thor's history before Mjolnir, the battle axe Jarnbjorn was added to the Marvel mythology. Sharp enough to cut through practically anything and charmed to be indestructible (lesson learned from Mjolnir, there), the weapon is as devastating in Thor's hand as you might think. The other option is Thor's signature weapon in Marvel's Ultimate universe - as the name suggests, the Ultimate Mjolnir. With one side of the weapon's head a hammer, the other an axe, it's twice as deadly. It's also built with a piece of Asgard itself inside of it, which could be carried over to Infinity War, since Ragnarok left Asgard in... thousands of tiny pieces, floating through space. Fans will have to wait and see if our suspicions are true, but for now, what do you think of our theory? Will Thor visit the Dwarves who forged Mjolnir and use his strength to craft a new weapon? Or are we off the mark?